The City of Lincoln Park is accepting applications to create an eligibility list for Full time Firefighter. Please click here for minimum qualifications as well as the required employment check off list. Office Business Hours: Monday – Thursday, 8 a.m. – 4 p.m. The City of Lincoln Park is an Equal Opportunity Employer. ATTENTION APPLICANTS: Evaluation of the employment application is part of the selection process. The City of Lansing reserves the right to limit the number of applicants who proceed for further consideration. Failure to obtain or maintain job required qualifications will result in appropriate action consistent with the provision of the Appropriate Collective Bargaining Agreement or Personnel Rules. THE CITY OF LANSING GIVES PREFERENCE TO QUALIFIED LANSING RESIDENTS IN HIRING FOR ALL CITY EMPLOYMENT. MILITARY VETERANS ARE ENCOURAGED TO APPLY. INTERESTED CANDIDATES ARE ENCOURAGED TO APPLY FOR THE CITY OF LANSING FIRE DEPARTMENT FIREFIGHTER EMERGENCY MEDICAL TECHNICIAN TRAINEE POSITION. 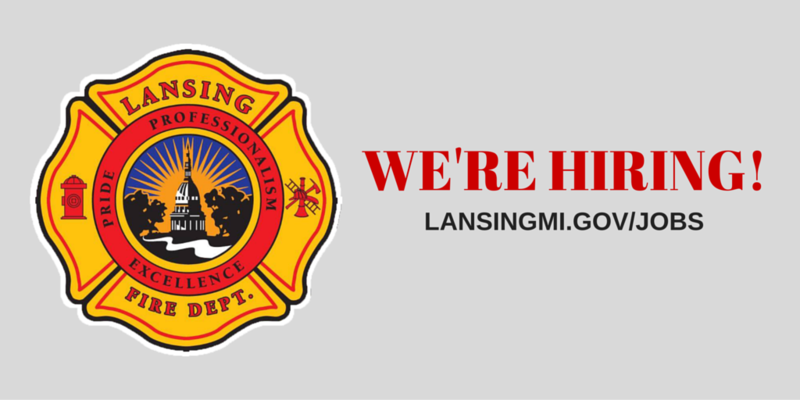 GENERATION OF THIS POSTING IS TO ESTABLISH A LIST OF ELIGIBLE CANDIDATES FOR FIRE ACADEMY TRAINEES WITHIN THE LANSING FIRE DEPARTMENT. MUST BE AVAILABLE TO WORK 24 HOUR SHIFTS, INCLUDING WORKING WEEKENDS, AND HOLIDAYS AND ON AN OVERTIME BASIS. Must be at least eighteen (18) years of age or older. Must be legally eligible to work in the United States. Must possess a valid Driver's License with a satisfactory driving record as defined by the Michigan Department of State and City of Lansing driving record standards. Must not have pending, or have been convicted of any felony charges and pass a criminal history record check. Must meet physical standards as determined by the City's Medical Director.Possess good moral character as determined by a favorable City of Lansing background investigation. Definition: Participates in an intensive training program in Basic Firefighting and Emergency Medical Services and Departmental Policies. 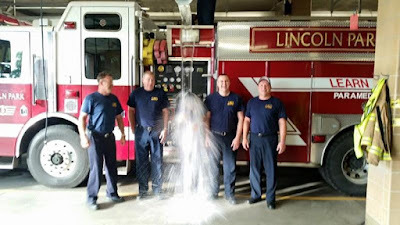 Candidates will be upgraded to Firefighter I status upon completion of City of Lansing Fire Department training and successful attainment of State Firefighter I and II certification, along with National Registry EMT license and successful completion of City of Lansing Fire Department recruit training. High School Diploma or GED. Firefighter I and II, EMT (Emergency Medical Technician), or Paramedic certification preferred. Candidates who have earned an Associate's or Bachelor's Degree OR up to 24 college semester credits are eligible to apply. Candidates MUST submit Official College Transcripts. Official College Transcripts must be enclosed in a sealed envelope – mailed directly from the college to the City of Lansing Department of Human Resources, 8th floor City Hall, Attn: Regina Wilson, 124 W Michigan Avenue, Lansing MI 48933. Proof of request for college transcripts is acceptable and may also be submitted with the online City of Lansing job application at www.lansingmi.gov . All candidates interested in seeking employment with the City of Lansing Fire Department MUST complete the online application available on the City website (www.lansingmi.gov ) and download the required Physicial Ability Test Waiver and Release and Background Check Authorization forms listed under the Additional Firefighter EMT Trainee Documents heading for submission by the application deadline. Candidates who are notified as meeting the minimum requirements MUSTparticipate in and successfully pass the ACT WorkKeys assessment test provided by ACT and proctored by Lansing Capital Area Michigan Works! Information regarding ACT WorkKeys assessment test is available on the ACT website at http://www.act.org/products/workforce-act-workkeys/. A cost of $50.00 is associated with taking the ACT WorkKeys assessment(Observation, Applied Math, and Locating Information) test. 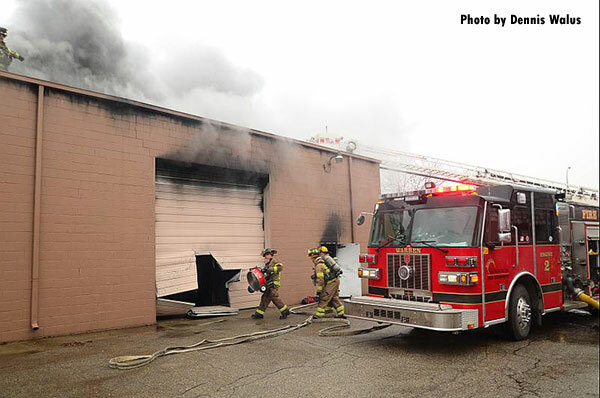 Make checks payable to City of Lansing Fire Department. Only certified checks or money orders will be accepted. Payments for ACT Work Keys assessment testing are due the date of testing at the site location. Valid Driver's License or State picture identification is required. Candidates who achieve a passing skill level on all WorkKeys assessments will be contacted and scheduled for the Lansing Fire Department Physical Ability Test (PAT). Candidates who are notified as being eligible to take the City of Lansing Fire Department Physical Ability test MUST produce the completed Physicial Ability form prior to participating in the City of Lansing Fire Department Physical Ability test. Candidates MUST also pass the City of Lansing Fire Department Physical Ability test. Candidates that provide proof of CPAT certification date within 120 days of the Lansing Fire Dept. Ability Test may be exempt from this requirement. A cost of $45.00 is associated with taking the City of Lansing Fire Department Physical Ability test. PHYSICAL ABILITY TEST TAKERS WILL NOT BE PERMITTED TO TEST WITHOUT THE COMPLETED PHYSICAL ABILITY TEST WAIVER & RELEASE FORM. Make checks payable to City of Lansing Fire Department. Only certified checks or money orders will be accepted. Payments for Lansing Fire Department Physical Ability testing are due the date of testing at the site location. Valid Driver's License or State picture identification is required. (Reasonable accommodations will be provided, if necessary, for individuals with disabilities who can perform the essential job functions with or without reasonable accommodations. Should you need any disability related accommodation in the application and/or selection process, please contact the Department of Human Resources). Required Knowledge, Skills & Abilities, Essential Job Functions and Environmental Conditions available upon request. Full job descriptions will be distributed to Candidates selected to participate in the selection process. METHOD OF APPLICATION: IF YOU WISH TO BE CONSIDERED FOR THIS POSITION, YOU MUST SUBMIT ALL REQUIRED DOCUMENTATION. ADDITIONAL AND PERTINENT DOCUMENTS MAY BE INCLUDED. *NOTE: FAILURE TO SUBMIT THE REQUIRED DOCUMENTATION / INFORMATION BY THE STATED DEADLINE WILL PRECLUDE YOU FROM FURTHER CONSIDERATION. Application and required documentation must be submitted to the following address, no later than 5:00 p.m. on April 8, 2016. Monday – Friday, 8:00 a.m. - 4:30 p.m.
*Documents may also be submitted in the City of Lansing Career Center Drop Box located on the 1ST floor of City Hall lobby or mailed to: City of Lansing Department of Human Resources, 8th floor City Hall, 124 W. Michigan Avenue, Lansing Michigan 48933. NO HAND DELIVERED DOCUMENTS WILL BE ACCEPTED. THE CITY OF LANSING IS AN EQUAL OPPORTUNITY EMPLOYER AND DOES NOT DISCRIMINATE IN ITS POLICIES OR PRACTICES ON THE BASIS OF RELIGION, RACE, COLOR, NATIONAL ORIGIN, GENDER, SEXUAL ORIENTATION, AGE, MARITAL STATUS, HEIGHT, WEIGHT, ARREST RECORD, OR DISABILITY OF ANY INDIVIDUAL. Age 21 or older by the closing date for accepting applications. Possess a high school diploma or G.E.D. equivalent. Possess a valid driver's license to operate a vehicle in the State of Michigan. Possess an Advanced Emergency Medical Technician License (A.E.M.T.) from the Michigan Department of Health. Possess Fire Fighter I and II. 1 point-Certificate in Fire Science from an accredited college or university. 2 points-Associate degree or higher degree in Fire Science from an accredited college or university. To receive preference points, you must provide an official (sealed by the school) college transcript. 1 point for service during a period of war or receipt of an expeditionary or campaign service medal during an emergency condition, with an honorable discharge. You must provide a copy of your Form DD214 to qualify. Written test administered by Empco Inc. Physical examination including drug screening and a psychological evaluation within the guidelines established by the City, as modified by current law. This is a full-time position and includes a generous benefit package, including a defined benefit pension plan. Applicants must create a profile, register and take the written exam to be administered by Empco Inc. Go to https://www.empco.net/testing to create a profile, register for the written exam and pay the exam fee. Applicants must complete the online profile and take the written exam by March 21, 2016. Applicants who score 70% or higher on the Empco written exam by the above deadline and meet Warren's preliminary requirements will receive an email instructing them to complete the City of Warren Fire Fighter application packet and bring it to the City of Warren Human Resources Department by the deadline stated in the email. You will be notified if you are scheduled for an oral board interview, and a two year eligibility list will be created. DESCRIPTION OF WORK: Under the supervision of a higher classified officer, responds to emergency fire and rescue service requests as part of a firefighting company. Carries out a variety of tasks relating to setting up firefighting apparatus, controlling fires and life savings, using defined procedures and practices. 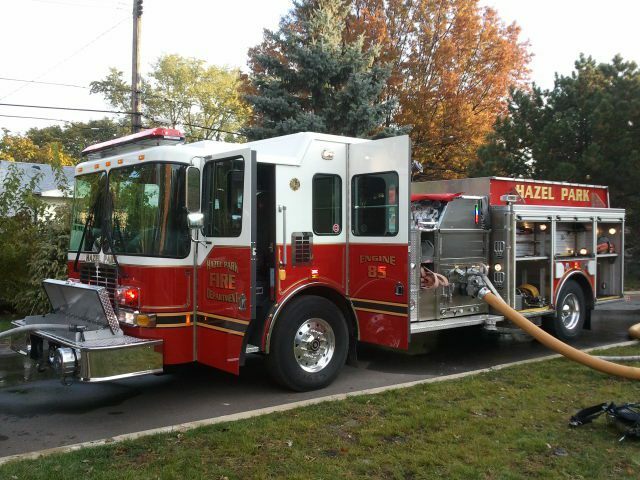 In addition, performs routine maintenance and cleaning of fire equipment and physical facilities of the fire station. QUALIFICATIONS: Possess a high school diploma or its equivalent. 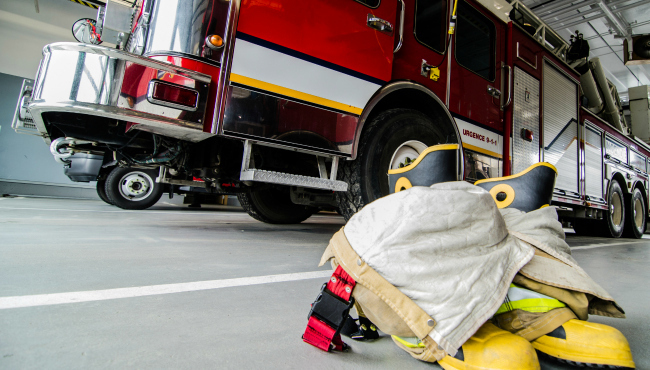 Possess a Firefighter I & II Certification*. Possess current Emergency Medical Technician (“EMT”) license*. Possess a valid Candidate Physical Ability Test (CPAT) taken within one (1) year of the current closing date. Possess a valid Michigan driver’s license. *Applications will not be accepted without attached copies of certifications/licenses. Note: Must pass all test/exams in order to be considered. Anyone offered employment as a Firefighter with the City of Muskegon must pass mandatory pre-employment exams, which includes a physical exam, back x-ray, psychological evaluation, and drug/alcohol screen. THE CIVIL SERVICE COMMISSION reserves the right to modify and/or waive examination parts. PURPOSE: The purpose of this recruitment is to establish eligibility/hiring list from which to fill vacancies in the City classified system during the term of the list. SPECIAL NOTE: If a question arises regarding the administration of any portion of a Civil Service examination, please direct such question to the Personnel/Civil Service Director (or designee) for possible resolution prior to appealing to the Civil Service Commission. LAST DATE FOR FILING APPLICATIONS: Friday, February 26, 2016, by 5:00 p.m. Note: Resumes are not accepted without required application. LAST DATE TO FILE APPLICATIONS: Applications for this examination must be received at the office of the Civil Service Department, 33000 Civic Center Drive, Livonia, MI 48154, no later than 5:00 p.m, Friday, February 19, 2016, in order to be accepted. The telephone number is (734) 466-2530. Be a citizen of the United States or a resident alien with the right to work in the United States. Have a high school diploma or valid equivalency certificate. Applicants will have two (2) points for a Bachelor’s Degree, or one (1) point for an Associate’s Degree, in a Fire Science or an EMS curriculum, added to their final score. Hold a current State of Michigan Paramedic License or National Registry EMT - Paramedic and be ACLS (Advanced Cardiac Life Support) certified, or currently enrolled in a Paramedic/ACLS curriculum. Possess or be in the process of obtaining the Conference of Western Wayne Firefighter Written and Physical Agility Test Certificates. THE AGILITY TEST CERTIFICATE MUST HAVE BEEN ISSUED IN THE TWELVE (12) MONTHS PRIOR TO THE CLOSING DATE OF THE ANNOUNCEMENT. Candidates must have passed both tests to proceed to the next examination process. Possess normal visual functions and acuity in each eye, correctable to 20/20 with eyeglasses. Be free from any physical defects, chronic diseases, organic or functional conditions or mental and emotional instabilities which may tend to impair the efficient performance of duties or which might endanger the lives of others or the individual employee. Possess and maintain a valid motor vehicle operator’s or a basic commercial driver’s license and have an acceptable driving record. A. A current State of Michigan Paramedic License or National Registry EMT - Paramedic, and be currently ACLS certified. A State of Michigan Firefighter II Certificate or equivalent certification in a state that has reciprocity. More information from the City of Livonia here. In order to be considered for this position you must have a Candidate Physical Ability Test (CPAT) certification at the time you submit your application. This will be posted until the position is filled. Role Summary: To protect life and property by combating, extinguishing and preventing fires and providing emergency medical assistance. Provides emergency response, basic/life support, fire prevention, rescue and fire suppression, as well as other duties associated with fire and rescue. Work involves risk and hazardous exposure. Work is performed under the direction of a superior officer. Related Work: Perform associated fire and rescue work as assigned. Pass any written and practical exam specified by the medical control board. Must possess or successful complete Pre-Hospital Trauma Life Support (PHTLS) certification and pass a Medical Control Authority (MCA) written exam that is required by the Washtenaw/Livingston Medical Control Authority to provide basic EMT services within the County of Washtenaw within the first six months of employment. This MCA certification shall be maintained throughout your employment with the City of Ann Arbor.